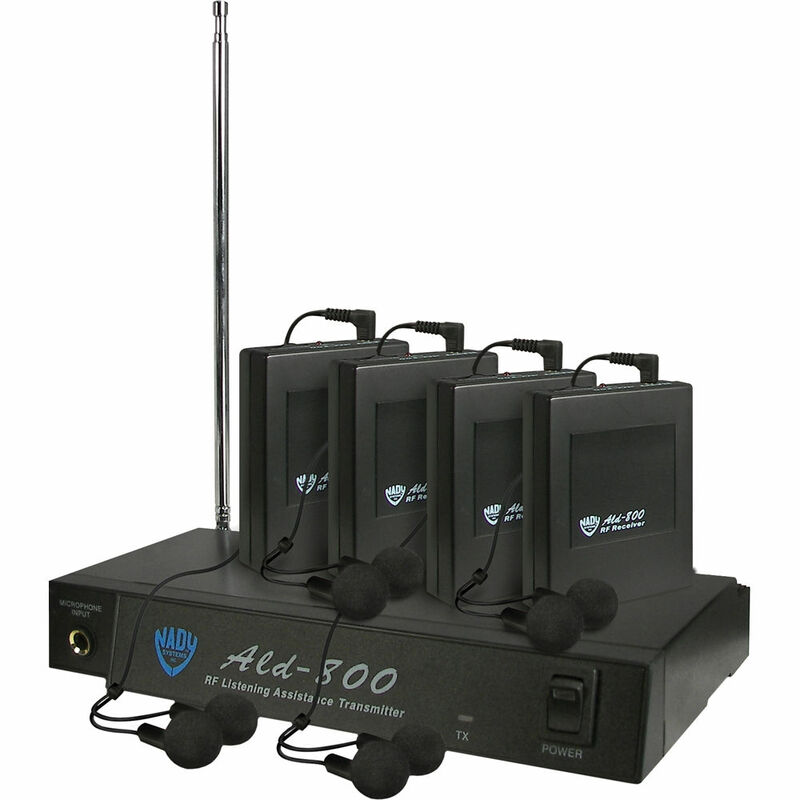 The ALD-800 from Nady is a versatile VHF wireless assistive listening system that allows you to share an audio source with multiple listeners up to 300' away, ideal for museums, theaters, houses of worship, educational facilities, and more. The system includes a base station transmitter and 4 beltpack receivers. The system can support an unlimited number of receivers (sold separately), allowing you to add as many listeners as you like. The system is pre-tuned to 1 of 8 channels designated for listening assistance by the FCC. This provides clear transmission, and also allows you to set up multiple systems for different applications in the same vicinity. The transmitter has mic and line level 1/4" input connectors with a manual input gain control. It also offers an automatic level control function. It has an extendable and positionable antenna, and LED indicators to show when the unit is turned on and transmitting audio. The transmitter operates on DC power via the included wall adapter. Each beltpack receiver is compact and lightweight, fitting easily into a pocket or clipping to clothing. The top panel offers a power/volume wheel with a power LED indicator. A standard 3.5mm headphone jack accommodates the included stereo earbuds, or most other consumer headphones. The receiver uses the headphone cable as the antenna to minimize bulk and weight. Each receiver operates on a single 9V battery. Note: Additional systems are available separately in 7 other pre-tuned frequencies from 72-76MHz. Box Dimensions (LxWxH) 10.7 x 9.7 x 5.3"
ALD-800 Wireless Assistive Listening System (HH: 75.9MHz) is rated 3.5 out of 5 by 4. Rated 4 out of 5 by Charles M. from Simple...reliable...affordable Works just as advertised. Very satisfied with this kit. We are using this to translate from Spanish to English in a Spanish church. Great product. Would recommend using your own earphones for better sound quality. Recently purchased 4 more receivers. They work perfect. Will consider buying again. Rated 3 out of 5 by Brian from They do the job The receivers seem to be cheaply made, but they do the job. For the price, I would buy them again. They work well for our church service. Rated 2 out of 5 by Anonymous from Don't buy it! The receivers are noisy and flimsy. Headset mini plugs must seat at the EXACT ring depth or the audio comes out only one side. Is this a stereo system? Are the batteries rechargeable? The batteries are not rechargeable. The system is weak in reception and I don't recommend it.